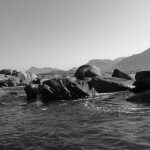 We are so lucky to live on the Cape Point Peninsula! 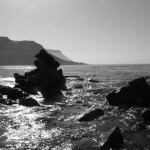 On days like this it makes you glad to be alive and living on the Cape Point Peninsula. The sun is out, there is no breeze to speak of and all seems gentle with the world. This week has seen a number of heavy issues pass through my desk and the family has been suffering from the dreaded lurgy; so we thought that we would take advantage of what could be the last nice weather for a while and head off to Jaeger’s Walk for a Sunday stroll. The weather at this time of year can be a delight, the sun is just strong enough to be able to feel it and there are days when the wind gives it a rest (very rare indeed are these days in summer). It is very easy to be drawn into the negativity that abounds in our daily lives, the media thrives on it- although one suspects that a news paper full of happy news stories would not last the week. In South Africa as a whole there are many things that negatively impact our daily lives, and we are seduced by the notion that they exist nowhere else on earth. And our own little corner of the world is not immune to such things. However, it does us no good to continually dwell on such matters and we need to once in a while remind our selves of why it is that we live where we live. It was a scene far removed from the usual picture of daily South African life, peaceful and relaxing, with all people seeming to be able to do their thing without ruining it for others. The calm, sunlit waters were a buzz with activity, kayakers, boaters and even some hardy swimmers. And as the sunlight played lazily on the water you could feel the tension and stress of the week ebb away (if only for a few moments), and allow the feeling of ‘yes, this is why I live here’ to return. 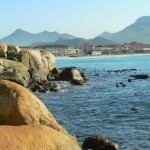 This entry was posted in General information and tagged Cape Point Chronicle, Cape Point Peninsula, Cape Point weather, fish hoek, life in the far south, walking in the western cape, what to do in Fish Hoek. Bookmark the permalink.